Dr. Damià Barceló (Catalan Institute for Water Research, Spain). The prize is awarded to Dr. Barceló for work at the leading edge of water science in understanding the effect of pharmaceuticals in the water environment, developing new methods for future risk assessment and management of emerging contaminants, and the investigation of water quality in intensively-used basins. Dr. Barceló’s research demonstrates that a broad spectrum of pharmaceuticals are widespread pollutants in aquatic environments and shows that wastewater treatment plant outlets are major contributors to the problem. At the same time, his work shows how the final treatment steps in treatment plants can considerably reduce the load of pharmaceuticals pollutants in outlets prior to their release, paving the way for more effective treatment processes to control the adverse impact of pharmaceutical pollutants. Using novel approaches, he was also able to demonstrate the presence of several pharmaceuticals, including ibuprofen, ketoprofen, diclofenac, ofloxacin and azithromycin in sewage sludge, revealing that some pharmaceutical compounds are not removed or are poorly removed by conventional activated sludge wastewater treatment. Using new analytical approaches for nanotechnologies residues assessment capable of achieving sensitivities in the low ng/L range, Dr. Barcelo was the first to report on the occurrence of fullerenes in suspended solids of wastewater effluents. His research has far-reaching applications, extending beyond water management. In one pioneering study, Dr. Barceló, for the first time, reported on the widespread occurrence of compounds such as cocaine, benzoylecgonine, ephedrine and ecstasy residues along the Ebro River basin (NE Spain). By evaluating the contribution of sewage treatment plants (STPs) effluents to the presence of these chemicals in natural surface waters, he was able to back calculate drug usage at the community level in the main urban areas of the investigated river basin. This unique forensic approach provided an extrapolation of the consumption data for the area studied, and exposed a total annual consumption of illegal drugs in the order of 36 tons, which would translate into 1100 million Euros on the black market. These studies are at the leading edge of their field and contribute significantly to our understanding of pharmaceuticals in the water environment, their impact and potential management strategies. 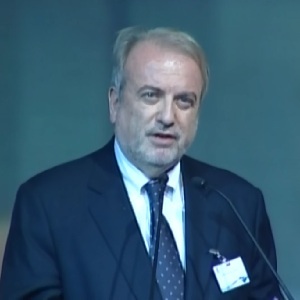 Dr. Damià Barceló is Director of the Catalan Institute for Water Research (ICRA). 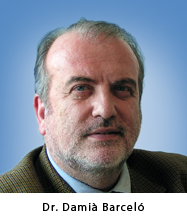 He is also Research Professor of the Scientific Research Council (CSIC) of the Government of Spain, at the Institute of Environmental Assessment and Water Research (IDAEA), Barcelona; and Visiting Professor at King Saud University, Riyadh, Saudi Arabia. • Ph.D. 1984; University of Barcelona, Analytical Chemistry. • B.Sc. 1977; University of Barcelona, Chemistry. 2007: King Jaime I Prize for the Protection of Nature, from Generalitat of Valencia, Spain. His Royal Highness Prince Khaled Bin Sultan Bin Abdulaziz, Prize Council members, and my fellow citizens of the world community, we meet today on the occasion of this internationally recognized water prize that I am honoured to accept and I wish to thank HRM and the Council members for this outstanding grant. In this speech I will draw your attention to the effects of pharmaceutical residues released in aquatic biota under a global change scenario of water scarcity. An increase of pharmaceutical discharges has been recently reported under horizon scan perspective of the global conservation issues for 2012 (Sutherland et al 2012). In addition, big questions concerning prioritization, pathways of exposure, bioavailability and risk of pharmaceuticals in the environment were also pointed out ( Boxall et al, 2012). I will ask you to share with me today some reflections concerning water scarcity problems around the world. Water is the most essential of all natural resources and water and water-related services are major components of human wellbeing and, as such, they are crucial factors of socio-economic development in Europe; yet, freshwater systems are threatened by a variety of stressors (organic and inorganic pollution, geomorphological alterations, land cover change, water abstraction, invasive species and pathogens - Vörösmarty et al. 2010). Each of these groups of stressors can have deleterious effects on freshwater ecosystems. Water scarcity can be a stressor on its own because of its structural character and drive the effects of other stressors (e.g., increasing concentrations of pollutants in rivers resulting from a constant input of pollution and decreasing water availability; Barcelo and Sabater, 2010, Petrovic et al. 2011). Since early in history, people have dumped sewage into waterways, relying on natural purification by dilution and by natural biodegradation. However, the rapid growth in population and changes in life style have resulted in a greater volume of domestic and industrial wastewater generated and subsequently discharged into the aquatic environment. Consequently water contamination has become one of the major environmental concerns faced by the world today. Water quality has a direct impact on citizens and economic sectors that use and depend on water, such as agriculture, tourism, industry, energy and transport. It also affects river-associated ecosystems and the biodiversity they host. The effects of water contamination on humans are many, including the disruption of the natural food chain, diseases as well as serious harm to aquatic ecosystems. Generally, pollution of the aquatic environment originates from point or diffuse (or non-point) sources. Point source pollution enters a water body at a specific site, such as a sewer, and can generally be readily identified. Potential point sources of pollution include effluent discharges from wastewater treatment plants (WWTP) and industrial sites, power stations, landfill sites, fish farms and oil spills from pipelines. Amongst them, waste water treatment plants (WWTP) deserve special attention as their effluents are the main source of many organic contaminants such as pharmaceuticals, illicit drugs and endocrine disruptors, among others. Point source pollution generally can be prevented or at least reduced, since it is possible to identify its origins. Therefore, the responsible person or agency can take immediate remedial action or invest in preventive measures such as longer-term investment in treatment and control facilities as well as reducing the loads of contaminants at the source. Diffuse pollution occurs where substances are widely used and dispersed over an area as a result of land-use activities such as agriculture, farming and forestry. Examples of diffuse pollution include the leaching to surface water and groundwater of contaminants from roads, veterinary pharmaceuticals such as antibiotic residues originated from manures, nutrients and pesticides used in agriculture. It is often difficult to identify specific sources of such pollution and prevention requires major changes in land use and management practices. The term “pharmaceutical” encompasses all prescription, non-prescription and over-the-counter therapeutic drugs, in addition to veterinary drugs and nutritional supplements. Personal care products include all consumer chemicals typically found in fragrances, lotions, shampoos, cosmetics, sunscreens, soaps, etc. In the EU around 3000 different pharmaceutically active compounds are used in human medicine. Most of modern drugs are small organic compounds, which are moderately water soluble, but still lipophilic, which allows them to be bioavailable and biologically active. They are designed to have specific pharmacologic and physiologic effects at low doses and thus are inherently potent, often with unintended outcomes in wildlife. Their consumption has increased over the years and will continue to increase due to the expanding population, general ageing, increase of per capita consumption, expanding potential markets, new target age groups, etc. After being administrated, pharmaceuticals are excreted via liver and/or kidneys as a mixture of parent compound and metabolites that are usually more polar and hydrophilic than the original drug. Thus, after their usage for the intended purpose, a large fraction of these substances is discharged into the wastewater, unchanged or in the form of degradation products, that are often hardly eliminable in conventional WWTPs. Depending on the efficiency of the treatment and chemical nature of a compound, pharmaceuticals can reach surface and ground waters. A fundamental characteristic of most biological systems is their diversity. The rapid loss of genetic, specific and functional diversity resulting from anthropogenic disturbances (e.g. chemical stressors) is a significant environmental problem with global consequences. Researchers and policymakers are becoming increasingly aware that species provide ecosystem goods and services that are essential for human welfare. Contaminants exert their effects at all levels of biological organization, from molecules to ecosystems. One of the most important entry ways of contaminants into ecosystems is by ingesting organic materials. Materials and energy are processed and flow in ecosystems throughout food webs. Bioconcentration is defined as the uptake of contaminants directly from water and bioaccumulation is the uptake of chemicals from either biotic (food) or abiotic (sediment) compartments. In aquatic organisms, bioconcentration describes the process which leads to higher concentration of a toxicant in the organism than in water. In the same way, bioaccumulation produces higher concentrations of a chemical in an organism than in its immediate environment, including food. Biomagnification refers specifically to the increase of contaminant concentration with trophic level. If biomagnification occurs, the concentration of contaminants increases with trophic level, i.e. concentrations in a consumer or predator exceed concentrations in the consumed prey. For example, periphyton and attached algae in streams concentrate contaminants several orders of magnitude above water levels. Organisms grazing these materials, such as several insect larvae (e.g. mayflies or midges), are exposed to significant concentrations that can be accumulated. Fish feeding on these contaminated insects may present elevated levels of a contaminant in tissues and consequently suffer a significant reduction in growth. The extent to which compounds accumulate and the routes that they are taken up and excreted may differ between type of organism and chemical involved. These concepts are widely recognized as useful indicators of a biological exposure to toxicants. Recent reviews presented data on bioacumulation as well as the environmental implications of chronic exposure of pharmaceuticals on aquatic biota samples (e.g. Fent et al., 2006, Huerta, et al 2012)). Pharmaceuticals introduced into the environment may affect the animals as they do in humans. However, as hundreds of different medical drugs are regularly used, when released into the environment, they may interact producing unknown effects. At least sub-lethal effects have been reported for mixtures of pharmaceuticals at concentrations similar to those found in the environment, pointing to a risk for the biota. For instance, the heart rate and fecundity of the freshwater crustacean Daphnia magna are sensitive to beta blockers, the psychiatric drug fluoxetine affects reproduction in the freshwater snail Physa acuta, the anti-inflammatory indomethacin produces changes on insect larvae growth, and antidepressants, lipid regulators, steroids, non-steroidal anti-inflammatory drugs, lipid regulators or antibiotics, induce sub-lethal effects on the reproduction, physiology and behaviour of fish (Corcoran et al. 2010). Ultra violet radiation absorbing chemicals (UV-filters) are added to sunscreens and a wide variety of cosmetics and thus have been detected in freshwater systems. They bioaccumulate in invertebrate, fish and fish-eating birds. To date, quite a lot of information has been generated about the effects of emerging pollutants on single organisms, but community approaches are very scarce . One example was recently reported by Ginebreda at al, 2010 using the Hazard Quotients (HQ) associated to the presence of pharmaceuticals in different points of the Llobregat river basin. Biodiversity of macro invertebrates was measured by the well known Shannon index, which is a measure of the ecological status. An inverse relationship was reported indicating that the presence of pharmaceutical residues can be associated with the loss of macro invertebrate diversity. In addition to that, experimental investigations on communities are difficult because of the long-term studies required and because endpoints are inconspicuous. In field studies it is rather problematic to predict the effects of emerging pollutants on communities because the effects of these substances on animals are poorly known (e.g. feminization or changes in behavior), and because other stressors often act simultaneously. Today, one of the major objectives for environmental scientists is to establish causal links between stressors and the quality of ecological systems. The potential ecological effects associated with the presence of pharmaceuticals in the aquatic environment have been largely ignored and there is a lack of data regarding effects on the aquatic ecosystems resulting from long-term low-dose exposure. Such analysis of chronic toxicity on organisms is essential to obtain a realistic environmental risk assessment, especially in the case of biologically active pharmaceuticals, because these substances were designed to exert distinct effects. Direct estimation of the effects caused by environmental pollutants on ecosystems is not a straightforward task. In real-world scenarios, contaminants rarely exist alone. Instead, they usually appear as mixtures of many compounds and their combined effects are difficult to predict (i.e., synergies or antagonisms may take place). Furthermore, many other stressing confounding factors (i.e., hydrology, climate change etc.) may take place at the same time, thus giving rise to a very complex situation, especially on Mediterranean rivers. Understanding the respective contribution and reciprocal feed-back of each one on a common integrated picture constitutes a tremendous scientific challenge in which the concurring interdisciplinary efforts of environmental chemists, biologists, hydrologists, engineers and even social scientists are needed. 1. The Need of More Information on Pharmaceutical Residues in the Total Environment. This inlcudes the design of tailor-made monitoring programs that include long-term, concurrent hydro-metereological, aquatic occurrence data on pharmaceutical residues inlcuding water, sediments and biota samples, morphology and biological monitoring of reference sites to improve evidence of causative links between climate variability and local ecological status. The assessment of the multiple effects of changes in the hydrogeological regime (duration, intensity, time and frequency of floods and droughts) on both biodiversity and ecosystem processes will need to be linked to pharmaceutical residues and other contaminants.Obviously under water scarcity the effects contaminants on the ecosystem will be enhanced and biodiversity is expected to decrease. 2. Advanced Waste Water Treatment Options. In this respect it is ncessary to find out he best end-of-pipe measures using, for instance, advanced technological approaches such as membrane bioreactors (MBRs), advanced oxodation proceses (AOP) and /or eco-friendly treatments such as white-rot-fungi (WRF). These treatment options guarantee higher removal efficiencies for most pharmaceuticals as compared to conventional activated sludge (CAS).Certainly under water scarcity there is a need of increasing water quantity. One way is by advanced treatment options and reusing the treated water for different purposes, in accordance with the water quality achieved following the taylor-made treatment. 3. The Low-Dose Prescribing Concept. The prescribed use of pharmaceuticals can result in unintended, unwelcome and potentially adverse consequences for the environment and for those not initially targeted, such as the aquatic biota. A recent paper by Daugthon and Rujoy 2013 introduced the prescriber ´s concept of the “patient”. It is known that any prescribed treatment can be unanticipated, so collateral impacts to the environment and costs beyond those commonly considered may take place. Attention to reducing these collateral impacts from non-optimized prescribing - especially via the use of lower, optimized dosing - could have reciprocal benefits for therapeutics outcomes and reduced costs for patients and society, such as waste avoidance. Reducing dosage will certainly play a key role on the issue of effects of pharmaceuticals in the aquatic systems. Pollution prevention is a key issue and needs the help of the policy makers and the society to be implemented in a proper way to effectively control and manage the risks associated between pharmaceutical residues and water scarcity. 2. Jelena Radjenovic, Mira Petrovic,, Damià Barceló; “Fate and Distribution of Pharmaceuticals in Wastewater and Sewage Sludge of Conventional Activated Sludge (Cas) and Advanced Membrane Bioreactor(Mbr) Treatment”; Water Research (Vol. 43) 831 – 841, 2009. 4. Meritxell Gros, Mira Petrović, Antoni Ginebreda, Damià Barceló; “Removal of Pharmaceuticals During Wastewater Treatment and Environmental Risk Assessment Using Hazard Indexes”; Environment International (Vol.36), 15–26, 2010. 5. Cristina Postigo, María José López De Alda, Damià Barceló; “Drugs of Abuse and Their Metabolites in the Ebro River Basin: Occurrence in Sewage and Surface Water, Sewage Treatment Plants Removal Efficiency, and Collective Drug Usage Estimation”; Environment International (Vol. 36) 75–84, 2010.